If you get the pun in the title, you're just as cool as I am...and no there can't be too many Disney references on my blog okay!? Anywhooo I didn't do much interesting this week except browse the internet and work so I thought I'd do a wishlist post! I've been wanting to start a wishlist series for a while now, which is why I've labelled this #1, but you may or may not ever hear from this series again depending on my mood. If you want to see more wishlists, let me know in the comments and I'll make an effort to continue the series! Pandora Royal Carriage Charm: I've been in love with this charm ever since I first saw it and you probably know why. Not only is it gorgeous and magical but it has a tiny pearl on top! My boyfriend bought me the castle one for Christmas and I'd love to have the matching set. Jo Malone Sakura Cherry Blossom Cologne: This one is part of their limited edition Blue Skies and Blossoms collection and my lord does it smell amazing. It's now been added to my wishlist within a wishlist of just Jo Malone related products. Not only does it smell like you've got your head in a blossom tree, but it has a pink bow. Yay! Michael Kors Selma Satchel: Because I need a pink bag in my life and this one is quite literally perfect. 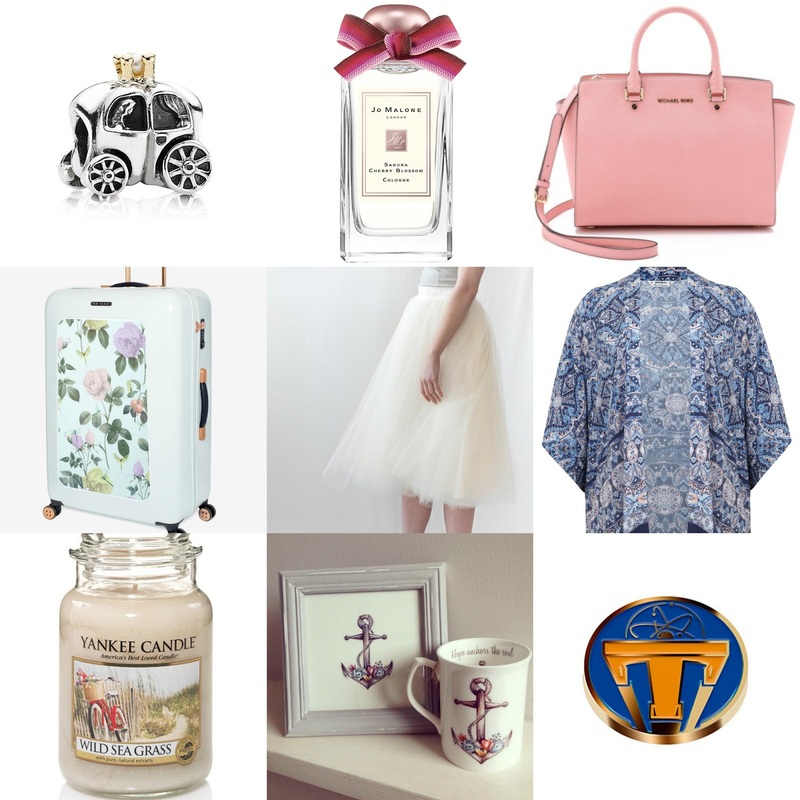 Ted Baker Rose Suitcase: I absolutely fell in love with this case the moment I laid eyes on it. This is actually the bigger version but I really wanted the hand luggage size which isn't on the website anymore *single tear*. If you want to love it even more, click the link & check out what the inside is like! Alexandra Grecco Tulle Skirt: I've been on the hunt for a white tulle skirt for a while now but nothing has come as close to perfect as the Alexandra Grecco ones. They are the only one for me and one day I hope to be lucky enough to own one. Miss Selfridge Kimono: Ahhhh it's so pretty! I love this kimono as I think it'll go with so many things for the Summer. The pattern is gorgeous as well. Yankee Candle Wild Sea Grass Candle: I'm in love with pretty much everything from the new Yankee Candle Life's A Beach range, and this is definitely one of my favourites. It smells like you're on holiday and that's all I need really. Anything by Paint Pallet: If you haven't heard of the wonderful Natalie's artwork then you are truly missing out! It really is something special. She creates some of the most beautiful pieces I've ever seen and I really would love basically anything by her one day! She also creates commissions so if you're looking for the perfect gift, she's your gal. Tomorrowland Pin: I went to see Tomorrowland recently and it has fast become one of my favourite films. I said to my boyfriend the other day that I would love one of the pins from the movie and viola! They appeared in the Disney Store as if they heard me! Why I don't drink, and that's okay.